To make the slaw, place the shredded red cabbage, apple, orange segments, cranberries, mint leaves, parsley and pistachio nuts in a large mixing bowl. Toss with the vinegar and olive oil. Set aside. To make the glazed, whisk the pomegrante juice, maple syrup, vinegar, soya sauce, ginger and star anise in a small bowl to blend. Transfer to a small saucepan and bring to a boil. Reduce the heat and cook until the sauce is slightly thickened, about 5 minutes. Line a big roasting tray with nonstick baking paper. Place the salmon in the middle and brush with half the glaze. Return the dish to the oven and bake for 10 minutes. 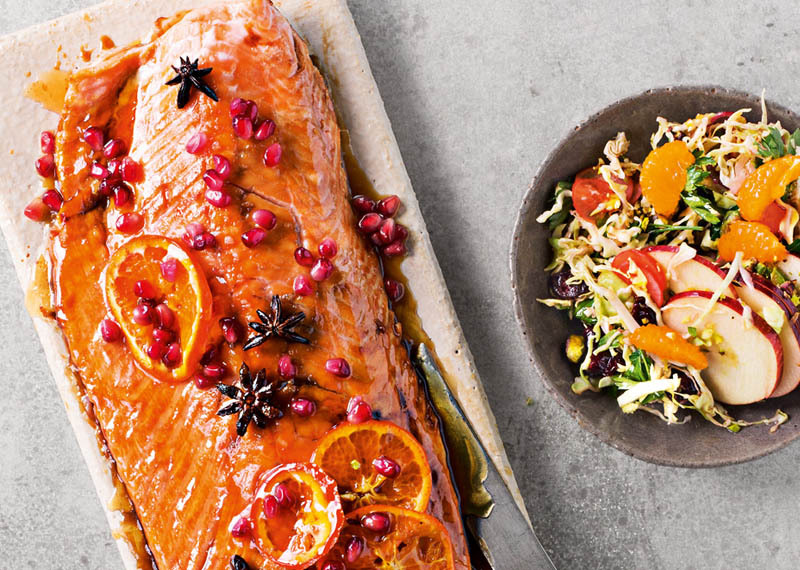 Remove and brush the salmon with the remaining glaze and bake for a further 10 minutes. Serve warm with the slaw.